Few ships are as famous as the Golden Hind, which first set out from London to explore the globe in 1577, captained by Sir Francis Drake. A replica of this iconic ship, the Golden Hinde, is docked on the River Thames in central London. Visitors can go aboard and learn more about the ship’s place in British history. The Golden Hind’s round-the-world voyage was a triumph of the Elizabethan era. The galleon also took part in the unsuccessful battle against the Spanish Armada in 1589, an expedition also captained by Drake. The ship was deconstructed in 1668—some of the ship’s timbers were used to make a chair that sits in the Bodleian Library in Oxford. The Golden Hinde, a full-size reconstruction of the original galleon, was made in the 1970s. It also traveled around the world, sailing more than 140,000 miles (225,310 kilometers) and visiting San Francisco, Japan, and the Caribbean along the way. Now docked, the ship welcomes visitors to climb aboard and follow an interactive self-guided tour. 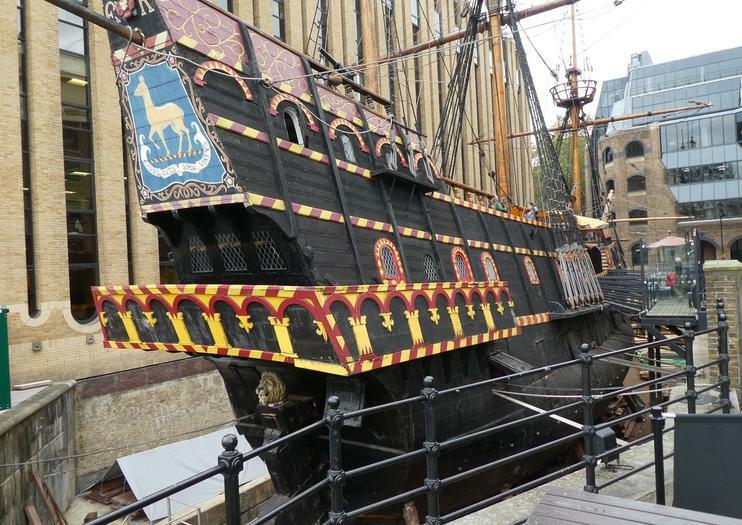 The Golden Hinde is a must for history buffs. Entry to the Golden Hinde is via paid ticket. Discounts are available for children. Purchase your tickets in advance online to avoid waiting upon arrival. The ship is not accessible to wheelchair users. The Golden Hinde is docked at St Mary Overie Dock in Southwark. The closest Underground stop is Borough (Northern Line). Many public buses stop nearby, including 17, 21, and 40. The ship is easily accessible on foot along the Thames Path riverside walkway. The Golden Hinde is open daily during daylight hours. It’s typically busiest on the weekends, especially in the early afternoon, so plan your visit during the week for a quieter experience. London in general is busiest in late spring and summer, so consider visiting in early spring or fall for relatively smaller crowds. Just around the corner from the Golden Hinde is Borough Market, one of London’s oldest remaining produce markets. You’ll find everything from fruits and vegetables to gourmet sausages on sale here, and there are many different street food stalls offering an array of delicious lunch options. Picture yourself as a member of the crew on Sir Francis Drake’s Golden Hinde. This ship is a faithful replica of Drake’s boat, it even recreated the Golden Hinde’s round the world journey. Costumed actors lead visitors through what it was like aboard the Elizabethan era ship, telling rip-roaring tales of life on the sea. Retrace the footsteps of iconic playwright William Shakespeare on this 2-hour walking tour of central London. Visit London’s lively South Bank and the legendary Shakespeare's Globe Theatre, plus see the site of the original theatre and its competitor, the Rose Theatre. Additional attractions include the Shakespeare stained glass window at Southwark Cathedral, Winchester Palace, the Golden Hind and the Anchor Pub. Discover the long history and numerous landmarks of London’s South Bank on a private 3-hour walking tour. The well-rounded itinerary is perfect if you want to get the lay of the land in this bustling area of the city. Stroll past the Tate Modern, Clink Prison Museum, Borough Market, HMS Belfast, and more. Along the way, listen to beguiling stories about famous locals and historical events. Experience London through a lens on this private photography tour and enjoy the undivided attention of your professional photographer guide. Learn how to get the best out of your camera, then put your newfound skills to the test as you walk capture classic London images like red telephone boxes, tube signs, and black cabs, or focus on landmarks like St Paul's Cathedral, Tate Modern, and The Globe Theatre. THE complete tour of London! Putting this tour together was no easy task; this is one of the most historically jam packet cities of the world, and there is an awful lot to cover! Over the course of four hours, we will cover over one thousand years of London; from the Roman conception and the Norman conquest, to Henry VIII, Cromwell, Queen Victoria and Shakespeare. Come with us through the little known alleyways and down to the off-the-beaten-track spots. Taking in the most impressive highlights and the most dramatic locations, this tour maps out the evolution of a city from its modest beginnings to a global powerhouse.